Esse livro, por ser novo (seu copyright é de 2011) deveria abordar mais métodos de neuroimagem. Ele trata apenas de: Functional Magnetic Resonance Imaging, Diffusion-Tensor Imaging and Behavioral Medicine, Perfusion MRI, Proton Magnetic Resonance Spectroscopy (1H MRS), Functional Near-Infrared Spectroscopy e Methodological Considerations for Using Bold fMRI in the Clinical Neurosciences (capítulos 3-8). Como acabei de encontrá-lo na internet e ainda não li, vamos dar um voto de confiança quanto à qualidade do que é abordado. Afinal, é da Springer e tem montes de MDs, MSs, PhDs e etc. na lista dos autores. Rapid developments in brain neuroimaging methods have occurred over the past decade. These advances have revolutionized cognitive and behavioral neuroscience, and are likely to have major influence on clinical psychological, psychiatric, and neurological practice over the coming years. There are a number of excellent books that focus on specific neuroimaging methods, such as fMRI. Furthermore, cognitive and neuroscience texts have increasingly incorporated functional brain neuroimaging. Yet, there are few books to date that consider and review emerging research in the application of brain neuroimaging methods for the study and assessment of behavioral and cognitive disorders. This book provides a broad coverage of current research trends in the clinical application of brain neuroimaging methods in the context of behavioral medicine, neuropsychology, and related areas of medical psychology. It uniquely integrates current neuroimaging methods and studies with current behavioral medicine research, and presents knowledge derived from recent developments in the fields of functional and structural brain imaging. By integrating information from experimental behavioral medicine with clinical insights, this book will serve as a source book for neuropsychologists, psychologists, neurologists, psychiatrists, and other professionals in both clinical practice and academic context. This integration results in the reader having a greater understanding of how the brain controls behavior, the disturbances of behavior that may occur with different disorders, and what clinicians should consider when assessing or working with patients with behavioral problems.Brain Imaging in Behavioral Medicine and Clinical Neuroscience Ronald Cohen, editorThe question “How does the mind work?” is an enduring one, with new answers appearing on a regular basis. Particularly significant developments in cognition and behavior research are coming from neuroimaging, a vital source of new studies on the role of the brain in health behavior. 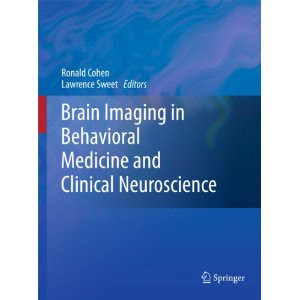 Brain Imaging in Behavioral Medicine and Clinical Neuroscience presents in depth the latest clinical and research applications of neuroimaging, surveying frequently used methods (among them fMRI, MRS, perfusion and diffusion imaging) and their uses in understanding brain behavior and pathology. Featuring chapters on specific disorders such as AIDS-related complications, Alzheimer’s disease, and stroke, and behavior medicine issues such as pain, substance abuse, and fatigue, this timely volume gives clinicians a wide-angle look at innovations with the potential to transform psychological and psychiatric practice.Brain Imaging in Behavioral Medicine and Clinical Neuroscience:• Describes a variety of structural and functional neuroimaging methods.• Discusses clinical strengths and limitations of these methods.• Offers current neuroimaging-derived findings on key topics in clinical neuroscience and behavioral medicine.• Reviews evidene regarding the use of neuroimaging in assessing specific brain and behavioral dysfunctions.• Considers how imaging methods can be combined to understand the relationships between brain structure, pathophysiology, and function.• Suggests areas for future research.The scope and detail of Brain Imaging in Behavioral Medicine and Clinical Neuroscience make it an essential reference not only for those specializing in these fields, but for clinical psychologists, psychiatrists, neurologists, and health providers as well.